Occupied by worthless material existence, wars, religious conflict, political conflict, environment alienated conduct, egocentricity and total disrespect for Life in all its presence, this civilization lives on the edge of self destruction, fully aware of the finite consequences. We should remember that environment destruction lies at the heart of self destruction. What to do to avoid any more catastrophic disasters couldn't be any clearer: End the exploitation, end the wars, end abuse and the destruction of human, animal and plant species. Next time you're loading your supermarket trolley stop and think for 30 seconds and you could make a decision that will change the fate of this over-productive, toxic chemicals saturated cancer inducing industries society to a more desirable alternative. 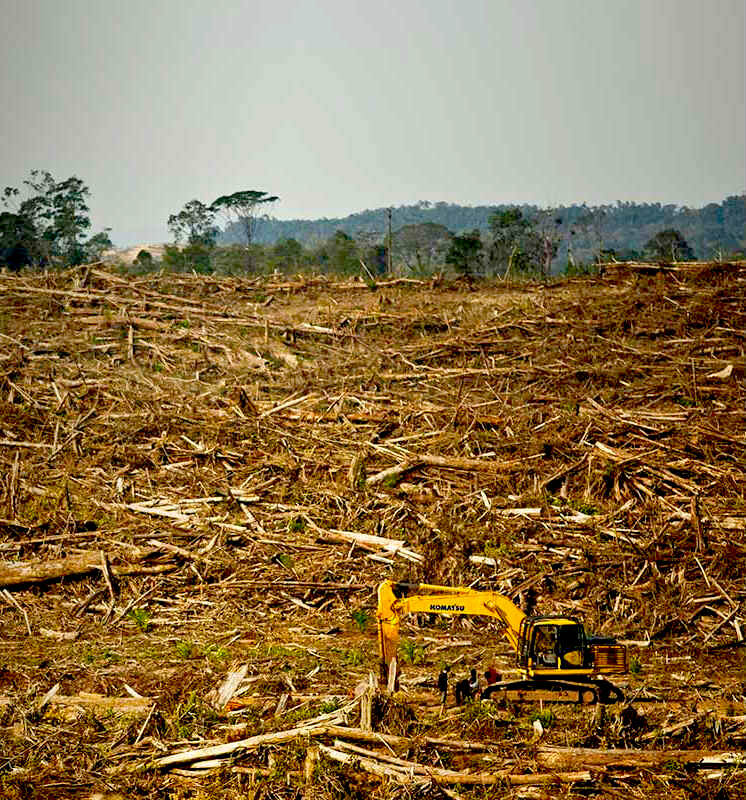 The vandalistic destruction of pristine forests and indigenous people and wildlife habitat is a disease created by pure profiteering under the guises of "the Economy" and "Feeding the World". What in reality this destruction creates is an industrial slavery system that feeds, entertains and propagates itself on its own manufactured demise. The entire world's civil infrastructure from its vast concrete highways and ghettos to its mundane daily routines, its religions, politics, military, social behavior, ego status syndrome, its literature, its commerce, advocacy people, "Admiralty Laws", flawed judiciary, and, to make this list short, everything touched by human "ingenuity" falls victim to exploitation, abuse and destruction - anyone needing proof has been living in a fake fantasy world. Corporations are the genie sucking everything into their domain, companies, individuals and other corporations - they are fewer and bigger by the day and rule today's world via highly developed technology on blatantly obvious lies and the premise that most people are too naive to see through the fog. Life never was a stairway to heaven, it has always been a one way down to the dungeons of depression, poverty and crime. Since everything had a beginning, the core of the disease cannot be found by merely tracing the history through endless time - the answer to the disease lies embedded within the conscience of every human being. Corporations operating under the guise of the word "Economics", financed by their easy money fishing shareholders and manipulated by those controlling the banking system to merge into fewer and bigger industrial control monopolies continue to push the Earth to ecologic collapse - the results have been demonstrated in the 1914-1918 World War I and again in the 1939-1945 World War II via a series of revolutions created by the same industrial corporations operating today, the difference now is that technology has pushed the mechanization of industry, commercial, political and social life to a height and pace never seen before in the entire traceable history of Earth's civilization. Despite the obvious visible symptoms of social collapse the same as before every other war, the general population continues its consumerism indulgence as if there is no tomorrow - reminiscent of a stampeding herd at a one day superstore closing down sale.